If you ever tried to lift with a stiff neck you quickly find out how difficult it really is. Not only will your lifts suffer but you may wind up hurting yourself even more by attempting to do this. That said, imagine if you had a quick weapon in your arsenal that allowed you to quickly make the pain go away and restore the range of motion that you were lacking because of the stiffness. I’m going to show you exactly that in this video. If you have a tough time rotating or turning your head to the left or right, you likely have one of two scenarios that are contributing to this problem. The first is a tissue restriction (most often muscle) that is preventing your vertebrae from moving as they would like. The second is a stuck joint that is preventing the vertebrae from moving as they would like. 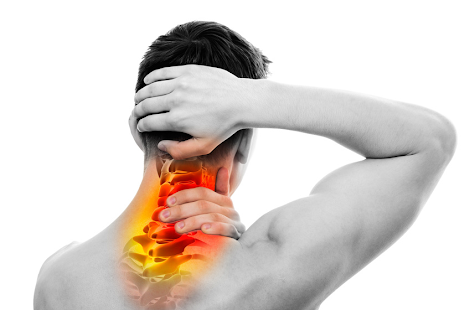 As you can see, in either case, the cervical vertebrae are not moving as they should and this is causing you pain and discomfort while limiting your ability to lift. Time to fix that. We start by realizing that rotation of the head in one direction or the other has an opposite reaction when looking at the spine from the standpoint of the spinous processes that sit behind each vertebrae body. In other words, when you turn your head to the left, your spinous process on your vertebra are turning to the right. This is important to know since this forms the basis of your treatment. With a towel, you place it around your neck and grasp each end with a hand. The towel should be at the level of the discomfort that you feel in your neck when you currently turn your head. This can be felt with either the towel on the back of your neck with by palpating the neck for soreness as you move down one vertebrae at a time. With the towel in the right location you begin by pulling harder on the hand that is opposite the direction you want to turn your head. For example, if you wanted to turn your head to the left you would pull forward and with more force on the right hand. The left hand would be there to simply stabilize the towel. As you pull forward you then want to rotate your head to the left. You should find that both your range of motion will have been greatly improved and your pain should have subsided. Do this for about 10 reps and then rest. You can do it again a few more times if needed later in the day to reestablish the proper mechanics and allow your spasmed muscles to subside. Once your neck is back and moving free of discomfort you can resume your hard training and start making those gains again.